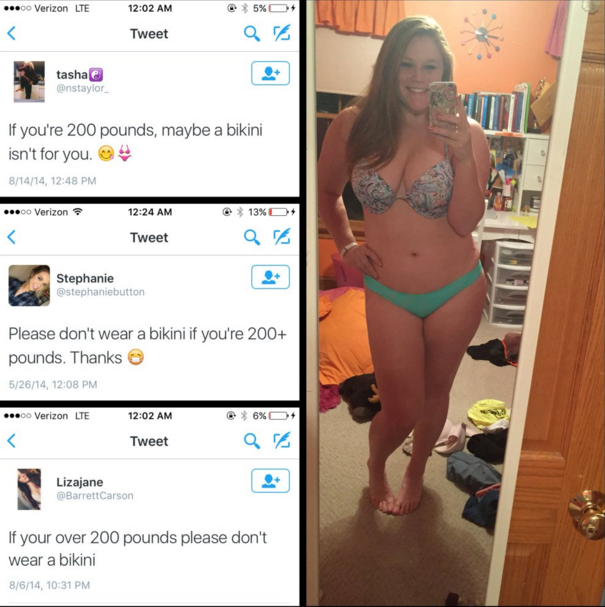 Student hits back at body-shamers who said "people over 200 pounds shouldn't wear bikinis"
A student has hit back at body-shamers on Twitter who said "if you're over 200 pounds please don't wear a bikini" by displaying these nasty tweets, right next to pictures of her rocking a bikini. Sara Petty, a 20-year-old student and blogger, saw several people commenting on what women over 200 pounds should and shouldn't wear. 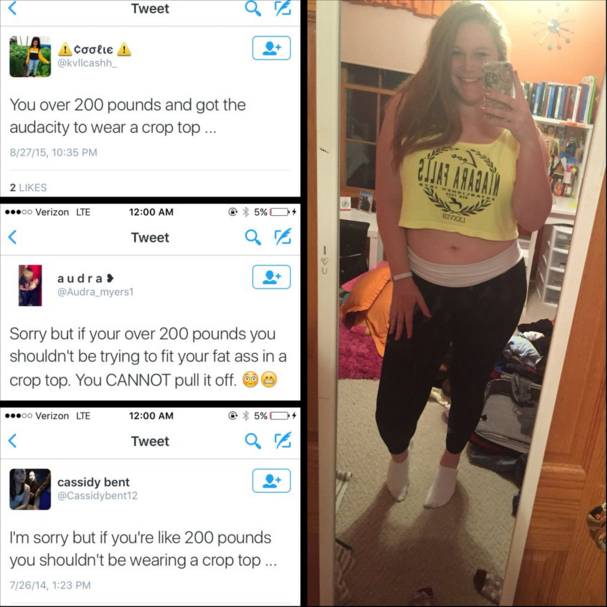 The comments she saw ranged from "sorry but if you're like 200 pounds you shouldn't be wearing a crop-top" to "Attention all girls over 200 pounds: please do yourself and all of us a favor and throw the booty shorts in the garbage. 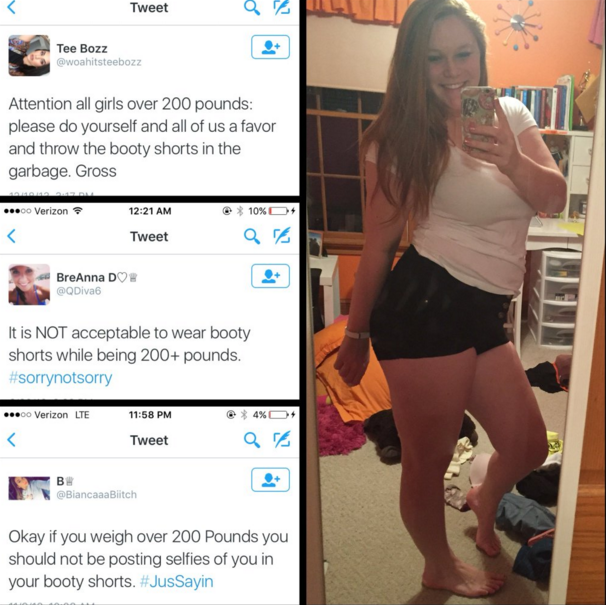 Gross"
She then decided to shame the shamers, by posting those grotesque comments next to pictures of herself undeniably rocking crop-tops and "booty shorts". The grotesque comments, which Sara tweeted, next to her rebuttal. Sara, told the Huffington post how she had seen the body-shaming tweets, and decided to do something about it. 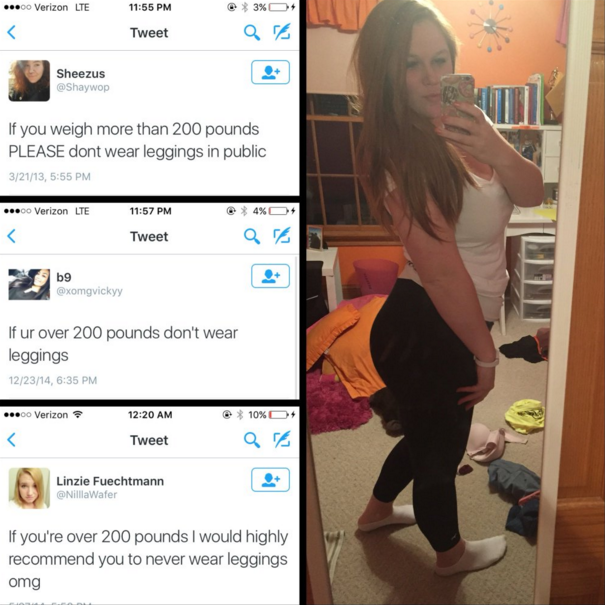 She put all the horrendous tweets together, next to her own photos, tweeting "Girls, wear whatever the hell you want" - gaining over 84K likes and 74K retweets, to the body-shamers' combined 2 likes and 0 retweets. "The audacity to wear a crop top" was the only body shaming tweet to get any likes. 2 likes, vs Sara's tens of thousands. The Bowling Green State University student has over 27K twitter followers and her own blog, where she describes herself as "a public relations major with a passion for puppies, writing and color-coding everything. I'm beautiful, hilarious and also quite modest." She has since taken to twitter to clarify her measurements for the benefits of body-shamers, and appealing to women to empower one another and stop tearing each other down. 2. The tweets were just about 200+ girls in general, NOT at me! 3. I'm 5 ft 11! Also- all of those tweets came from WOMEN. Girls, stop tearing other girls down. Empower one another! !